The idea of buying a holiday home somewhere sunny may sound like a great idea, but this doesn’t always translate to a wise property investment. Let’s go over eight important considerations you need to carefully weigh up when working out if you should buy a holiday home. Remember, this is not a long-term rental property so your tenant market is entirely different. Hence, you need to use property managers experienced in short-term accommodation letting who will charge more for their services; in some instances, you’ll pay as much as 20% of the rental. Then there’s the consistent marketing of your holiday-let investment, which essentially has to happen all year round to be effective as people book their vacations months in advance. These expenses need to be accounted for in your cashflow calculations. Given that holidaymakers seek accommodation seasonally, particularly in traditional summer ‘hotspots’, you can never bank on consistent yields when it comes to a lifestyle investment. This means you need to be financially capable of sustaining the mortgage repayments and associated costs of holding such an asset, independent of the sporadic income it generates. Renting out holiday accommodation requires your property to be fully furnished and equipped with the necessities, such as cutlery, glassware and crockery. The nature of this short-term rental market means greater wear and tear will be inflicted on your investment than would normally be the case. It’s more likely you’ll be footing regular bills for repair works due to a greater risk of accidental damage, and will need to replace furnishings and appliances frequently. One of the many perks property investors enjoy for providing private rental accommodation in this country is negative gearing. But in some cases, the ATO will only allow you to claim any legitimate deductions associated with your lifestyle investment during periods where it’s tenanted or available for lease. This means if you use the property for your pleasure, you might only be able to claim a portion of what would usually be fully deductible costs of ownership. This decreases its income earning potential and in turn, augments holding costs, which in effect cancels out any savings you think you are making on your holidays. Owning a holiday home doesn’t mean a lifetime of free sabbaticals, because in one way or another you are paying for it. In fact it would probably be cheaper to vacation overseas once a year than own a lifestyle investment! 6. Groundhog day – Do you really want to visit the same place year after year? This is something you need to really think about. While it can be nice to have traditionally favoured family vacation spots, the novelty could soon get old. Consider all the missed opportunities if you feel obligated to return to your holiday let in order to justify ownership, foregoing other new adventures to exotic locations. You buy a holiday home with the idea that you’ll enjoy long, lazy summers there with the family. But if you need it to generate an income in order to continue sustaining all those holding costs, there’s less chance it will be your family enjoying your investment and more likelihood it will be the short term tenants you rely on to generate an income. Most holiday locations rely on one or two seasonal industries to sustain their local economy. Demand for accommodation is erratic and while it might be in short supply during peak periods, that consistent interest from owner-occupiers (who determine long term growth patterns in property markets), is just not there. 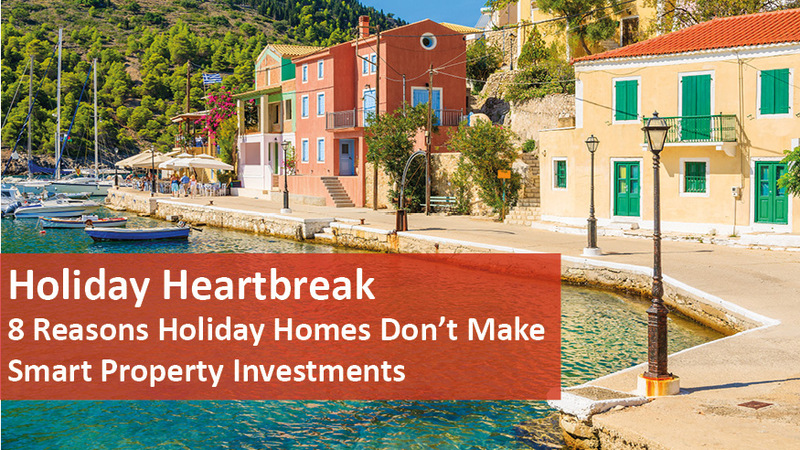 Additionally, spending on holiday home investments tends to be discretionary, meaning they’re more susceptible to the negative effects of any economic downturns. This makes them less reliable in terms of capital gains and more difficult to offload if you really need to rid yourself of the debt burden. At the end of the day, building a property portfolio is a business proposition, whereas family holidays represent a more emotional investment. If your aim is to create a viable retirement fund through real estate – which it really should be if you decide to invest in this asset class – then vacation in someone else’s holiday let while you relax, safe in the knowledge that your high-growth property investments are working hard for you. For more property tips and tricks visit the blog section of the Naked Real Estate website.